Photometric and spectroscopic observations of the faint Supernovae (SNe)2002kg and 2003gm, and their precursors, in NGC 2403 and NGC 5334,respectively, are presented. The properties of these SNe are discussedin the context of previously proposed scenarios for faint SNe: low-massprogenitors producing underenergetic SNe; SNe with ejecta constrained bya circumstellar medium; and outbursts of massive Luminous Blue Variables(LBVs). The last scenario has been referred to as `Type V SNe', `SNimpostors' or `fake SNe'.The faint SN 2002kg reached a maximum brightness of MV =-9.6, much fainter than normal Type II SNe. The precursor of SN 2002kgis confirmed to be, as shown in previous work, the LBV NGC 2403-V37.Late-time photometry of SN 2002kg shows it to be only 0.6 mag fainter at500 d than at the epoch of discovery. Two spectra of SN 2002kg, with anapproximately 1-yr interval between observations, show only minordifferences. Strong FeII lines are observed in the spectra of SN 2002kg,similar to both the LBV NGC 2363-V1 and the Type IIn SN 1995G. Thespectrum of SN 2002kg does show strong resolved [NII] atλλ6549,6583 Å. The identified progenitor of SN2003gm is a bright yellow star, consistent with a F5-G2 supergiant,similar to the identified progenitor of SN 2004et. SN 2003gm, at theepoch of discovery, was of similar brightness to the possible fake SN1997bs and the Type IIP SNe 1999br and 2005cs. Photometrically SN 2003gmshows the same decrease in brightness, over the same time period as SN1997bs. The light curve and the spectral properties of SN 2003gm arealso consistent with some intrinsically faint and low-velocity Type IISNe. The early-time spectra of SN 2003gm are dominated by Balmeremission lines, which at the observed resolution, appear similar to SN2000ch. On the basis of the post-discovery photometric and spectroscopicobservations presented here, we suggest that SN 2003gm is a similarevent to SN 1997bs, although the SN/LBV nature of both of these objectsis debated. At 226 d post-discovery the spectrum of SN 2003gm isstrongle contaminated by HII region emission lines, and it cannot beconfirmed that the precursor star has disappeared. The presence ofstrong [NII] lines, near Hα, is suggested as a possible means ofidentifying objects such as SN 2002kg/NGC 2403-V37 as being LBVs -although not as a general classification criterion of all LBVsmasquerading as SNe. An ultraluminous X-ray microquasar in NGC5408? We studied the radio source associated with the ultraluminous X-raysource in NGC5408 (LX ~ 1040ergs-1).The radio spectrum is steep (index ~ -1), consistent with optically thinsynchrotron emission, not with flat-spectrum core emission. Its fluxdensity (~0.28 mJy at 4.8 GHz, at a distance of 4.8 Mpc) was the same inthe March 2000 and December 2004 observations, suggesting steadyemission rather than a transient outburst. However, it is orders ofmagnitude higher than expected from steady jets in stellar-massmicroquasar. Based on its radio flux and spectral index, we suggest thatthe radio source is either an unusually bright supernova remnant, or,more likely, a radio lobe powered by a jet from the black hole (BH).Moreover, there is speculative evidence that the source is marginallyresolved with a radius ~30 pc. A faint HII region of similar sizeappears to coincide with the radio and X-ray sources, but its ionizationmechanism remains unclear. Using a self-similar solution for theexpansion of a jet-powered electron-positron plasma bubble, in theminimum-energy approximation, we show that the observed flux and(speculative) size are consistent with an average jet power ~ 7 ×1038ergs-1 ~ 0.1LX ~0.1LEdd, an age ~105 yr, a current velocity ofexpansion ~80 km s-1. We briefly discuss the importance ofthis source as a key to understand the balance between luminosity andjet power in accreting BHs. We study the self-consistent, linear response of a galactic disc tovertical perturbations, as induced, say, by a tidal interaction. Wecalculate the self-gravitational potential corresponding to anon-axisymmetric, self-consistent density response of the disc using theGreen's function method. The response potential is shown to oppose theperturbation potential because the self-gravity of the disc resists theimposed potential, and this resistance is stronger in the inner parts ofa galactic disc. For the m= 1 azimuthal wavenumber, the disc responseopposes the imposed perturbation up to a radius that spans a range of4-6 disc scalelengths, so that the disc shows a net warp only beyondthis region. This physically explains the well known but so farunexplained observation that warps typically set in beyond this range ofradii. We show that the inclusion of a dark matter halo in thecalculation only marginally changes (by ~10 per cent) the radius for theonset of warps. For perturbations with higher azimuthal wavenumbers, thenet signature of the vertical perturbations can only be seen at largerradii - for example, beyond 7 exponential disc scalelengths for m= 10.Also, for the high-m cases, the magnitude of the negative disc responsedue to the disc self-gravity is much smaller. This is shown to result incorrugations of the mid-plane density, which explains the puzzlingscalloping with m= 10 detected in HI in the outermost regions ~30 kpc inthe Galaxy. There is still no consensus as to what causes galactic discs to becomewarped. Successful models should account for the frequent occurrence ofwarps in quite isolated galaxies, their amplitude as well as theobserved azimuthal and vertical distributions of the HI layer.Intergalactic accretion flows and intergalactic magnetic fields may bendthe outer parts of spiral galaxies. In this paper we consider theviability of these non-gravitational torques to take the gas off theplane. We show that magnetically generated warps are clearly flawedbecause they would wrap up into a spiral in less than two or threegalactic rotations. The inclusion of any magnetic diffusivity to dilutethe wrapping effect causes the amplitude of the warp to damp. We alsoconsider the observational consequences of the accretion of anintergalactic plane-parallel flow at infinity. We have computed theamplitude and warp asymmetry in the accretion model, for a disc embeddedin a flattened dark matter halo, including self-consistently thecontribution of the modes with azimuthal wavenumbers m= 0 and m= 1.Since the m= 0 component, giving a U-shaped profile, is not negligiblecompared to the m= 1 component, this model predicts quite asymmetricwarps, maximum gas displacements on the two sides in the ratio 3 : 2 forthe preferred Galactic parameters, and the presence of a fraction ~3.5per cent of U-shaped warps, at least. The azimuthal dependence of themoment transfer by the ram pressure would produce a strong asymmetry inthe thickness of the HI layer and asymmetric density distributions in z,in conflict with observational data for the warp in our Galaxy and inexternal galaxies. The amount of accretion that is required to explainthe Galactic warp would give gas scaleheights in the far outer disc thatare too small. We conclude that accretion of a flow with no net angularmomentum cannot be the main and only cause of warps. Evidence for a universal slope of the period-luminosity relation from direct distances to Cepheids in the LMC. We have applied the infrared surface brightness (ISB) technique toderive distances to 13 Cepheid variables in the LMC which have periodsfrom 3-42 days. The corresponding absolute magnitudes define PLrelations in VIWJK bands which agree exceedingly well with thecorresponding Milky Way relations obtained from the same technique, andare in significant disagreement with the observed LMC Cepheid PLrelations, by OGLE-II and Persson et al., in these bands. Our datauncover a systematic error in the p-factor law which transforms Cepheidradial velocities into pulsational velocities. We correct the p-factorlaw by requiring that all LMC Cepheids share the same distance.Re-calculating all Milky Way and LMC Cepheid distances with the revisedp-factor law, we find that the PL relations from the ISB technique bothin LMC and in the Milky Way agree with the OGLE-II and Persson et al.LMC PL relations, supporting the conclusion of no metallicity effect onthe slope of the Cepheid PL relation in optical/near infrared bands. 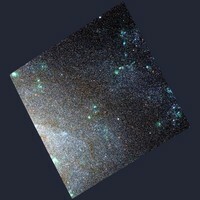 The deepest X-ray images of M31, obtained with XMM-Newton, are examinedto derive spectral and statistical properties of the population of thevery soft X-ray sources. When classifying supersoft X-ray sources (SSSs)with criteria based on the same hardness ratios defined for recentChandra observations, one-quarter of the selected SSSs turn out to besupernova remnants (SNRs). Another quarter of the SSSs are spatiallycoincident with recent classical novae, although they are less than 10%of the nova population observed in the last 25 yr. Only 3 out of the 15non-SNR SSSs show clear variability, with X-ray flux variation of morethan 1 order of magnitude within a few months. Two of these sourcesdisplay additional, smaller amplitude variability on timescales ofseveral minutes. Their broadband spectra and those of the novae areapproximately fitted with a blackbody or white dwarf atmospheric modelat near-Eddington luminosity for the distance of M31. Two SSSs appear toreach very large, perhaps super-Eddington luminosities for part of thetime and probably eject material in a wind until the luminositydecreases again after a few months. Most quasi-soft sources (QSSs) arerepeatedly detected. I discuss the possibility that most QSSs in M31 maybe SNRs or foreground neutron stars. Two X-ray sources with both a softand hard component are in the positions of a recurrent nova and apossible symbiotic nova, but they are probably black hole transients. The stellar content of the spiral galaxy NGC 247 is investigated usingdeep visible and near-infrared images. The main-sequence turnoff (MSTO)in the inner 12 kpc of the disk corresponds to an age of ~6 Myr. A meanstar formation rate (SFR) of 0.1 Msolar yr-1during the past 16 Myr is computed from star counts. The color of thered supergiant plume does not change with radius, suggesting that themean metallicity of young stars does not vary by more than ~0.1 dex. Thenumber of bright main-sequence stars per local stellar mass densityclimbs toward larger radii out to a distance of 12 kpc; the scalelengths that characterize the radial distributions of young and oldstars in the disk thus differ. The density of bright main-sequence starswith respect to projected H I mass gradually drops with increasingradius. The population of very young stars disappears in the outer disk;the MSTO at galactocentric radii between 12 and 15 kpc corresponds to~16 Myr, while between 15 and 18 kpc the age is >=40 Myr. Red giantbranch (RGB) stars are resolved at a projected minor-axis galactocentricdistance of ~12 kpc. There is a broad spread in metallicity among theRGB stars, with a mean [M/H]~-1.2. The RGB tip occurs ati'=24.5+/-0.1, indicating that the distance modulus is27.9+/-0.1. Luminous AGB stars with an age ~3 Gyr are also seen in thisfield.Based on observations obtained at the Gemini Observatory, which isoperated by the Association of Universities for Research in Astronomy,Inc., under a cooperative agreement with the NSF on behalf of the Geminipartnership: the National Science Foundation (United States), theParticle Physics and Astronomy Research Council (United Kingdom), theNational Research Council of Canada (Canada), CONICYT (Chile), theAustralian Research Council (Australia), CNPq (Brazil), and CONICET(Argentina).This publication makes use of data products from the Two Micron All SkySurvey, which is a joint project of the University of Massachusetts andthe Infrared Processing and Analysis Center/California Institute ofTechnology, funded by the National Aeronautics and Space Administrationand the National Science Foundation. We have used the Advanced Camera for Surveys on board the Hubble SpaceTelescope to obtain deep photometry of the NGC 300 spiral galaxy in theSculptor group. The results have been used to derive an accuratedistance determination based on the tip of the red giant branch distanceestimator. Both edge-detection and maximum likelihood methods have beenapplied to derive a distance modulus(m-M)0=26.30+/-0.03+/-0.12 for edge detection and(m-M)0=26.36+/-0.02+/-0.12 for maximum likelihood. Theseresults are fully consistent with the recent distance estimate derivedfrom near-IR photometry of Cepheids variable stars in the context of theAraucaria project, (m-M)0=26.37+/-0.05+/-0.03 (Gieren andcoworkers).Based on observations made with the NASA/ESA Hubble Space Telescope,obtained at the Space Telescope Science Institute, which is operated bythe Association of Universities for Research in Astronomy, Inc., underNASA contract NAS 5-26555. These observations are associated withprogram GO-9492. Star formation in galaxies is triggered by a combination of processes,including gravitational instabilities, spiral wave shocks, stellarcompression, and turbulence compression. Some of these persist in thefar outer regions, where the column density is far below the thresholdfor instabilities, making the outer disk cutoff somewhat gradual. Weshow that in a galaxy with a single exponential gas profile the starformation rate can have a double exponential, with a shallow one in theinner part and a steep one in the outer part. Such double exponentialshave been observed recently in the broadband intensity profiles ofspiral and dwarf irregular galaxies. The break radius in our modeloccurs slightly outside the threshold for instabilities, provided theMach number for compressive motions remains of order unity to largeradii. The ratio of the break radius to the inner exponential scalelength increases for higher surface brightness disks because theunstable part extends farther out. This is also in agreement withobservations. Galaxies with extended outer gas disks that fall moreslowly than a single exponential, such as 1/R, can have their starformation rate scale approximately as a single exponential with radius,even out to 10 disk scale lengths. Hα profiles should drop muchfaster than the star formation rate as a result of the rapidlydecreasing ambient density. The explosion of supernovae and the evolution of their remnants (SNRs)accelerate cosmic rays over a vast range of timescales. Magnetic fieldscan be investigated indirectly through one of the observationalsignatures of this acceleration, namely radio synchrotron emission. Withthe aim of better understanding the role of the magnetic field insupernova evolution, we explore the variation of SNR radio luminositieswith physical conditions in the surrounding interstellar medium. With adata set that comprises more than 90 individual SNRs in 10 galaxies, anda range of 3000 in ISM density and 104 in radio synchrotronluminosity, we find a significant correlation between the twoquantities. The observed trends support the hypothesis that adiabaticcompression of magnetic fields by itself is insufficient to explain theradio emission of the brighter and more luminous in SNRs. We study the nuclear star clusters (NCs) in spiral galaxies of variousHubble types using spectra obtained with the STIS on board the HubbleSpace Telescope (HST). We observed the nuclear clusters in 40 galaxies,selected from two previous HST WFPC2 imaging surveys. At a spatialresolution of ~0.2" the spectra provide a better separation of clusterlight from underlying galaxy light than is possible with ground-basedspectra. Approximately half of the spectra have a sufficiently highsignal-to-noise ratio for detailed stellar population analysis. For theother half we only measure the continuum slope, as quantified by the B-Vcolor. To infer the star formation history, metallicity, and dustextinction, we fit weighted superpositions of single-age stellarpopulation templates to the high signal-to-noise ratio spectra. We usethe results to determine the luminosity-weighted age, mass-to-lightratio, and masses of the clusters. Approximately half of the sampleclusters contain a population younger than 1 Gyr. Theluminosity-weighted ages range from 10 Myr to 10 Gyr. The stellarpopulations of NCs are generally best fit as a mixture of populations ofdifferent ages. This indicates that NCs did not form in a single event,but that instead they had additional star formation long after theoldest stars formed. On average, the sample clusters in late-typespirals have a younger luminosity-weighted mean age than those inearly-type spirals (L=8.37+/-0.25 vs.9.23+/-0.21). The average mass-weighted ages are older by ~0.7 dex,indicating that there often is an underlying older population that doesnot contribute much light but does contain most of the mass. The averagecluster masses are smaller in late-type spirals than in early-typespirals (logM=6.25+/-0.21 vs. 7.63+/-0.24) and exceed the masses typicalof globular clusters. The cluster mass correlates loosely with totalgalaxy luminosity. It correlates more strongly with both the Hubble typeof the host galaxy and the luminosity of its bulge. The lattercorrelation has the same slope as the well-known correlation betweensupermassive black hole mass and bulge luminosity. The properties ofboth nuclear clusters and black holes in the centers of spiral galaxiesare therefore intimately connected to the properties of the host galaxy,and in particular its bulge component. Plausible formation scenarioshave to account for this. We discuss various possible selection biasesin our results, but conclude that none of them can explain thedifferences seen between clusters in early- and late-type spirals. Theinability to infer spectroscopically the populations of faint clustersdoes introduce a bias toward younger ages, but not necessarily towardhigher masses.Based on observations made with the NASA/ESA Hubble Space Telescope,obtained from the Data Archive at the Space Telescope Science Institute,which is operated by the Association of Universities for Research inAstronomy, Inc., under NASA contract NAS5-26555. These observations areassociated with proposals 9070 and 9783. The Hubble Space Telescope Advanced Camera for Surveys has been used todetermine accurate distances for 20 galaxies from measurements of theluminosity of the brightest red giant branch stars. Five associations ofdwarf galaxies that had originally been identified based on strongcorrelations on the plane of the sky and in velocity are shown to beequally well correlated in distance. Two more associations with similarproperties have been discovered. Another association is identified thatis suggested to be unbound through tidal disruption. The associationshave the spatial and kinematic properties expected of bound structureswith (1-10)×1011 Msolar. However, theseentities have little light, with the consequence that the mass-to-lightratios are in the range 100-1000 MsolarL-1solar. Within a well-surveyed volume extendingto a 3 Mpc radius, all but one known galaxy lie within one of the groupsor associations that have been identified. We carry out an objective classification of four samples of spiralgalaxies having extended rotation curves beyond the optical radius. Amultivariate statistical analysis (viz., principal component analysis[PCA]) shows that about 96% of the total variation is due to twocomponents, one being the combination of absolute blue magnitude andmaximum rotational velocity beyond the optical region and the otherbeing the central density of the halo. On the basis of PCA a fundamentalplane has been constructed that reduces the scatter in the Tully-Fisherrelation up to a maximum of 16%. A multiple stepwise regression analysisof the variation of the overall shape of the rotation curves shows thatit is mainly determined by the central surface brightness, while theshape purely in the outer part of the galaxy (beyond the optical radius)is mainly determined by the size of the galactic disk. Using imaging data from the SDSS survey, we present the g' and r' radialstellar light distribution of a complete sample of ~90 face-on tointermediate inclined, nearby, late-type (Sb-Sdm) spiral galaxies. Thesurface brightness profiles are reliable (1 σ uncertainty lessthan 0.2 mag) down to μ27 mag/''. Only ~10% of all galaxies havea normal/standard purely exponential disk down to our noise limit. Thesurface brightness distribution of the rest of the galaxies is betterdescribed as a broken exponential. About 60% of the galaxies have abreak in the exponential profile between  1.5-4.5 times thescalelength followed by a downbending, steeper outer region. Another~30% shows also a clear break between  4.0-6.0 times thescalelength but followed by an upbending, shallower outer region. A fewgalaxies have even a more complex surface brightness distribution. Theshape of the profiles correlates with Hubble type. Downbending breaksare more frequent in later Hubble types while the fraction of upbendingbreaks rises towards earlier types. No clear relation is found betweenthe environment, as characterised by the number of neighbours, and theshape of the profiles of the galaxies. We have performed a search for variable stars in the dwarf irregulargalaxy NGC 6822 using wide-field multi-epoch VI photometry down to alimiting magnitude V  22. Apart from the Cepheid variables in thisgalaxy already reported in an earlier paper by Pietrzynski et al. (2004), we have found 1019 "non-periodic" variable stars, 50periodically variable stars with periods ranging from 0.12 to 66 daysand 146 probably periodic variables. Twelve of these stars are eclipsingbinaries and fifteen are likely new, low-amplitude Cepheids.Interestingly, seven of these Cepheid candidates have periods longerthan 100 days, have very low amplitudes (less than 0.2 mag in I), andare very red. They could be young, massive Cepheids still embedded industy envelopes. The other objects span a huge range in colours andrepresent a mixture of different types of luminous variables. Many ofthe variables classified as non-periodic in the present study may turnout to be periodic variables once a much longer time baseline will beavailable to study them. We provide the catalogue of photometricparameters and show the atlas of light curves for the new variablestars. Our present catalogue is complementary to the one of Baldacci etal. (2005) which has focussed on very short-period and fainter variablesin a subfield in NGC 6822. We present high-dispersion spectra of two extremely massive starclusters in galactic merger remnants, obtained using the UVESspectrograph mounted on the ESO Very Large Telescope. One cluster, W30,is located in the ~500 Myr old merger remnant NGC 7252 and has avelocity dispersion and effective radius of σ=27.5±2.5 kms-1 and Reff=9.3±1.7 pc, respectively. Theother cluster, G114, located in the ~3 Gyr old merger remnant NGC 1316,is much more compact, Reff=4.08±0.55 pc, and has avelocity dispersion of σ=42.1±2.8 km s-1. Thesemeasurements allow an estimate of the virial mass of the two clusters,yielding Mdyn(W30)=1.59(±0.26)× 10^7Mȯ and Mdyn(G114)=1.64(±0.13)×10^7 Mȯ. Both clusters are extremely massive, being morethan three times heavier than the most massive globular clusters in theGalaxy. For both clusters we measure light-to-mass ratios, which whencompared to simple stellar population (SSP) models of the appropriateage, are consistent with a Kroupa-type stellar mass function. Usingmeasurements from the literature we find a strong age dependence on howwell SSP models (with underlying Kroupa or Salpeter-type stellar massfunctions) fit the light-to-mass ratio of clusters. Based on this resultwe suggest that the large scatter in the light-to-mass ratio of theyoungest clusters is not due to variations in the underlying stellarmass function, but instead to the rapidly changing internal dynamics ofyoung clusters. Based on sampling statistics we argue that while W30 andG114 are extremely massive, they are consistent with being the mostmassive clusters formed in a continuous power-law cluster massdistribution. Finally, based on the positions of old globular clusters,young massive clusters (YMCs), ultra-compact dwarf galaxies (UCDs) anddwarf-globular transition objects (DGTOs) in κ-space we concludethat 1) UCDs and DGTOs are consistent with the high mass end of starclusters and 2) YMCs occupy a much larger parameter space than oldglobular clusters, consistent with the idea of preferential disruptionof star clusters. We report the results of time-resolved photometric and spectroscopicnear-infrared observations of the Ofpe/WN9 star and LBV candidateGCIRS34W in the Galactic Centre star cluster. Diffraction limitedresolution photometric observations obtained in H- and K-bands show astrong, non-periodic variability on time scales from months to years inboth bands, accompanied by variations of the stellar colour. ThreeK-band spectra obtained in 1996, 2003, and 2004 with integral fieldspectrometers are identical within their accuracies and excludesignificant spectroscopic variability. The most probable explanation ofthe stellar photometric variability is obscuration by circumstellarmaterial ejected by the star. The approximated position of GCIRS34W inan HR diagram is located between O supergiants and LBVs, suggesting thatthis star is a transitional object between these two phases of stellarevolution. Luminous BA-type supergiants have enormous potential for modernastrophysics. They allow topics ranging from non-LTE physics and theevolution of massive stars to the chemical evolution of galaxies andcosmology to be addressed. A hybrid non-LTE technique for thequantitative spectroscopy of these stars is discussed. Thorough testsand first applications of the spectrum synthesis method are presentedfor the bright Galactic objects η Leo (A0 Ib), HD 111613 (A2 Iabe),HD 92207 (A0 Iae) and β Ori (B8 Iae), based on high-resolution andhigh-S/N Echelle spectra. Stellar parameters are derived fromspectroscopic indicators, consistently from multiple non-LTE ionizationequilibria and Stark-broadened hydrogen line profiles, and they areverified by spectrophotometry. The internal accuracy of the methodallows the 1σ-uncertainties to be reduced to 1-2% in T_effand to 0.05-0.10 dex in log g. Elemental abundances are determined forover 20 chemical species, with many of the astrophysically mostinteresting in non-LTE (H, He, C, N, O, Mg, S, Ti, Fe). The non-LTEcomputations reduce random errors and remove systematic trends in theanalysis. Inappropriate LTE analyses tend to systematicallyunderestimate iron group abundances and overestimate the light andα-process element abundances by up to factors of two to three onthe mean. This is because of the different responses of these species toradiative and collisional processes in the microscopic picture, which isexplained by fundamental differences of their detailed atomic structure,and not taken into account in LTE. Contrary to common assumptions,significant non-LTE abundance corrections of ~0.3 dex can be found evenfor the weakest lines (Wλ 10 mÅ). Non-LTEabundance uncertainties amount to typically 0.05-0.10 dex (random) and~0.10 dex (systematic 1σ-errors). Near-solar abundances arederived for the heavier elements in the sample stars, and patternsindicative of mixing with nuclear-processed matter for the lightelements. These imply a blue-loop scenario for η Leo because offirst dredge-up abundance ratios, while the other three objects appearto have evolved directly from the main sequence. In the most ambitiouscomputations several ten-thousand spectral lines are accounted for inthe spectrum synthesis, permitting the accurate reproduction of theentire observed spectra from the visual to near-IR. This prerequisitefor the quantitative interpretation of intermediate-resolution spectraopens up BA-type supergiants as versatile tools for extragalacticstellar astronomy beyond the Local Group. The technique presented hereis also well suited to improve quantitative analyses of less extremestars of similar spectral types. I present a new analysis of CCD-based BVRI broadband photometry for theglobular cluster NGC 2419, based on 340 CCD images either donated bycolleagues or retrieved from public archives. The calibrated resultshave been made available through my Web site. I compare the results ofmy analysis with those of an independent analysis of a subset of thesedata by Saha et al. (2005, PASP, 117, 37), who have found acolor-dependent discrepancy of up to 0.05 mag between their I-bandphotometry and mine for stars in this cluster. I conclude that a majorpart of the discrepancy appears to be associated with small shuttertiming errors (a few hundredths of a second) in the Mini-Mosaic (MIMO)camera on the WIYN 3.5 m telescope. Smaller contributions to the anomalylikely come from (1) a color-scale error with a maximum amplitude of~+/-0.02 mag in my secondary standard list as of 2004 September, and (2)statistical effects arising from the previous study's use of arelatively small number of standard-star observations to determine acomparatively large number of fitting parameters in the photometrictransformations.Based in part on observations obtained at the 3.5 m and 0.9 m WIYNTelescopes. The WIYN Observatory is a joint facility of the Universityof Wisconsin-Madison, Indiana University, Yale University, and theNational Optical Astronomy Observatory (NOAO).